The former world number one downed Kei Nishikori in straight sets to seal his place in the second round. Novak Djokovic described his opener at the Mutua Madrid Open as ‘perfect’ as he toppled Kei Nishikori, 7-5, 6-4, in the first round. The Serb was aiming to avenge his disappointing showing at the Barcelona Open two weeks ago, where he crashed out to Martin Klizan. And he couldn’t have asked for a more difficult assignment to begin his quest to reclaim the trophy he had collected twice before during his career. 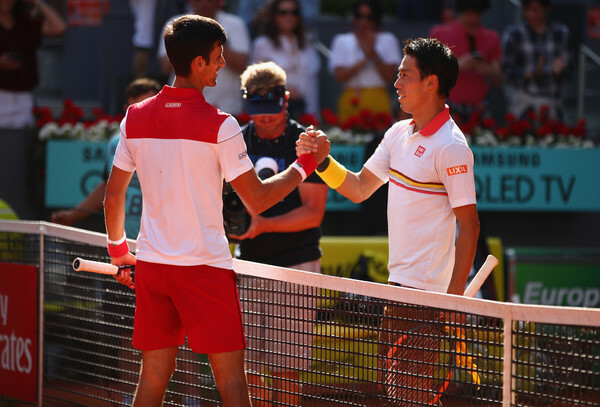 Nishikori, himself having just returned to the tour in February following a six-month layoff, reached the final of the Monte-Carlo Rolex Masters last month and was undoubtedly coming into the contest the hotter player. “Kei [Nishikori] is a quality player,” the Serb acknowledged post-match. “We both haven’t had too many of these kind of matches in the last twelve months. He played well in Monte-Carlo and played the finals there. Both players have grown accustomed to being awarded first round byes at Masters 1000 events, but the deterioration in their respective rankings set-up a mouthwatering opening round clash. Djokovic broke at the most opportune time in both sets, edging the opening frame 7-5 in 68 minutes. His level steadily increased as the match wore on, matching the Japanese’s intensity and he sealed his place in the next round as the clock ticked a minute over two hours. “I’m glad that the match went my way, but it could have gone his way as well,” said Djokovic. “It was a very few points that really decided a winner today. “I managed to play the right shots in the important moments. In both the first and second set I made breaks to win both sets at the really final stages of both sets. Djokovic awaits the winner of Kyle Edmund’s clash with Daniil Medvedev.